Because I’ve placed bar charts inside each circle in the Occupations piece, I couldn’t just put the text in the middle of a circle as well, like the standard zoomable pack layout has. Placing the titles of parent circles on the outer edge of the circle seemed like the most fitting alternative in my opinion. But circle packing is definitely not the only case when placing text on a non-straight line could come in handy. Let me illustrate this with several examples. Starting off with the bare necessities. You really don’t need to do much to place text on any kind of path that you want. The first thing that you need is the path itself. You need to tell the browser what the exact shape is along which the text needs to be placed. Once you have that figured out, you can append a textPath element to the SVG, which tells the browser that the text needs to be rendered along the shape of a path. SVG paths can take a whole array of wonderful shapes. For a good tutorial on the different shapes they can take please look at this SVG path element tutorial. One random example of a path notation to create a wavy line path is M10,90 Q100,15 200,70 Q340,140 400,30. Below you can see the result of placing text on this SVG path. Don’t worry too much about how this looks, in the following steps I’ll explain how to create a circular path notation which is very straightforward and in many of the later examples d3 easily calculates these paths for you. The code for the above image can be seen down below. Create an SVG and append a path element to it. You supply the arc notation to the d attribute of the path. It’s very important to give this path element a unique id that you can reference later on when creating the textPath element. After the path element, you have to create a text element to which a textPath element can be attached. Just appending the textPath to the SVG will not work, it needs to be appended to a text element first. Most other tutorials or stackOverflow questions that I found while figuring this out myself stopped right about here. But I do typically create (endlessly) long tutorials, so read on if you want to see what other interesting things you can do. Although you’re able to place text on any kind of path that you can think of with the M’s, Q’s, A’s and Z’s of the SVG path element, most of the time you’ll just want to place text along a circle. Therefore, I wanted to go a bit deeper into the path notation of an SVG arc. Let me first show the different elements and afterwards explain them one by one. First we need to supply the location of the starting position. This is done with the M (from move) command followed by the x and y coordinate of this location on the screen. This is not unique to arcs, you need to supply this for every kind of SVG path. We can draw an arc with the A command followed by the radius of the arc in the x and y direction. For circles both of these numbers are the same. The third parameter is the x-axis-rotation. This sets the rotation of the arc’s x-axis. Leave it at 0. Of the four candidate arc sweeps, two will represent an arc sweep that is >180 degrees (the large-arc), and two will represent an arc sweep that is <180 degrees (the small-arc). If large-arc-flag is 1, then one of the two larger arc sweeps will be chosen; otherwise, if large-arc-flag is 0 one of the smaller arc sweeps will be chosen. If sweep-flag is 1, then the arc will be drawn in a positive-angle/clockwise direction. A value of 0 causes the arc to be drawn in a negative-angle/counter-clockwise direction. And finally the position of the ending x and y coordinate are supplied to the arc notation. Creating a transition between two different arcs is actually quite easy. You only have to update the original path element itself and the text will move with it automatically. So all you have to do to go from the bigger circle in the section above to a somewhat smaller circle is add the following code to the script. It calls a transition of the path and supplies an arc notation of a smaller circle. One option for placing texts along arcs is when creating donut charts. In this instance we can use the arc notations that the d3.svg.arc() command creates for us as paths to stick a textPath to. You might wonder why centering the text from the previous example along the arc, instead of placing at the start would need its own section. Why not use the text-anchor and startOffset like before? The problem is that the actual arc of each donut slice is the entire outline. So an arc section on top at the outer radius + a line segment + another arc section for the inner radius and then it closes the path, which happens to look like another line segment. Luckily, we can do something about it. It doesn’t take many lines, but if you’re new to regular expressions some parts of the code might seem a bit odd to you. 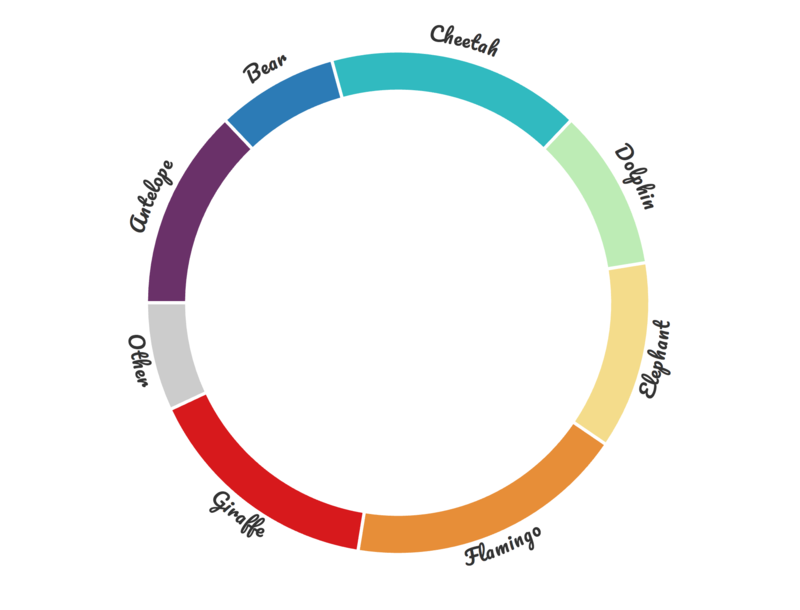 To change things up a bit I’ve created a completely random dataset about animals and turned this into a donut chart. I already added the label names and placed them along the start of each slice. That’s a rather incomprehensible piece of text. But if we look closer, we can detect that the first part follows that notation for an arc path as explained before. Rounding it off a bit and placing some spaces, the first section reads M -52.2,-195.7 A 202.5, 202.5 0 0,1 138.3,-147.9. Which is an arc starting at [-52.2,-195.7] with a radius of 202.5, running clockwise to [138.8,-147.9]. To use the startOffset at 50% again to center the labels, we need to extract this first arc statement from the total arc path that d3.svg.arc() gives us and then create a second set of (invisible) arc paths that run only alongside the outside radius section of each donut slice. Let me first show you the code that does exactly this and explain it piece by piece next. //stopping after the first match"
The first six lines are normal when creating a donut chart, we’ve even removed the line with .attr("id", ) since we are going to create new arcs for the textPaths. Next it goes into an .each() statement which will execute the code within for each data element. In here we can reference the data with the normal d and i. In this .each() section the arc notation of the outer radius is extracted. By looking at that horrible arc path that arc(pie(donutData)) returns, we would like to save the section from the start of the result until we get to the capital L (but not including the L) into a new arc path. This can be done by using a regular expression. A regular expression, or regex, is “a sequence of characters that define a search pattern”. If you’re serious about doing data analytics or visualization, you’re bound to run into these at some point. The variable firstArcSection saves the regex needed for the extraction. It will capture all in between the start of a string, denoted by ^, and the first capital letter L. The “all in between” is denoted by .+? where the . is a regular expression for “match any single character except the newline character”. The + means “match the preceding expression 1 or more times”. And since the . precedes it, it means any single character 1 or more times. The ? has to be added to make sure that it stops at the first L it finds, not the last L. It thus makes sure that the idea of ^. *L matches the fewest possible characters. For more information on regular expressions see this link. The firstArcSection is applied to the total arc string that d3 has created for the donut slice (given by d3.select(this).attr("d")) and the result is saved in newArc. This is only the path section that runs along the outer radius of the donut slice (the arc) and is what we want to link the textPath to. Therefore a new (invisible) path using newArc is added to the SVG in the last section of the .each() with, of course, a unique id. You could think that it’s finished with the look from the previous section. But I find those labels along the bottom half, that are upside down, rather difficult to read. I’d prefer it if those labels were flipped, so I can read them from left to right again. The only thing that has changed since the previous section is the addition of the if statement. To flip the start and end positions, we can use a few more regular expressions. The current starting x and y location is given by everything in between the capital M and the capital A. The current radius is denoted by everything in between the capital A and the 0 0 1 of the x-axis-rotation, large-arc flag & sweep-flag. Finally the end location is given by all in between the 0 0 1 and the end of the string (denoted by a $ in regex). Therefore, we save all the separate pieces in different variables and build up/replace the newArc using the final line in the if statement which has switched the start and end position. However, the textPath section needs a small change. For the bottom half arcs, the dy attribute shouldn’t raise the labels above the arc paths, but lower the labels below the arc paths. Therefore, we need a small if statement which will result in two different dy values. To be able to use the d.endAngle in the if statement I replaced the donutData by pie(donutData) in the .data() step. You can still reference the data itself by using d.data instead of just d, which you can see in the .text() line of code. And that’s it for the tutorial that originated from my A Closer Look at the division of Occupation visual. I hope you enjoyed it! PS | As with most of my tutorials, the code above is only one way to do things. I wouldn’t be surprised if it’s not the most efficient way to do it, but it’s a way to accomplish things.